When you look at JoJo Siwa, you see a happy girl — one who never leaves the house without colorful clothes, a big bow in her hair and a smile on her face. But even though she always had a positive attitude, that doesn’t mean the dancer and YouTube star hasn’t dealt with negativity. You see, the 13 year old has had a lot of experience with one negative group in particular: bullies. Any JoJo fan knows she’s passionate about ending bullying — she even wrote a song about it, “Boomerang.” Her passion for the cause began when she watched a classmate being tormented at school, and has only increased when she’s heard what her fans go through and what she’s experienced herself with online haters. So if you’re being treated unfairly, never fear — JoJo knows just how to handle it. When JoJo was in the third grade, she was the new kid at school. On her very first day, she noticed there was a girl with special needs who no one was hanging out with. “At recess, [other kids] said, ‘Don’t talk to her,’” JoJo remembers. Since JoJo was the new girl and she was only 7 years old, she listened to them. But then, everything changed. It happened one day in math class, when they were having a banana split party. Sounds fun, right? The trick was you had to get your multiplication tables correct in order to add each ingredient to your ice cream treat. JoJo finished hers and was eating her sundae when she noticed the girl her classmates picked on was sitting in the corner. The girl was so excited and thankful, it made JoJo think. “That was the moment I was like, ‘Why was everyone so mean to this kid?’” she explains. That was the first time JoJo dealt with bullying, but unfortunately, it wasn’t the last. In school, she felt like a bystander, watching someone else being bullied and eventually speaking up. But once she became famous, she started dealing with bullying of her own. “I get bullied a lot on social media, and it’s terrible,” she opens up. “People comment, ‘You’re fat, you’re ugly, you’re rude, you’re annoying, you’re a bad dancer.’ And it’s hard to read those comments.” But she does her best not to let these insults get to her by laughing them off and surrounding herself with positive people. But dealing with these personal attacks has given JoJo one very important mission: to stop all bullying. “It’s a very hard goal,” she admits. “But, what I want is to tell people who are getting bullied to stand up to the bully and not let it be OK — tell a teacher, the principal or your parents. I want people to stand up and to be confident.” JoJo doesn’t want you to accept other people treating you poorly because you’re amazing — and we agree! Interview and story by Caitlin Murphy. 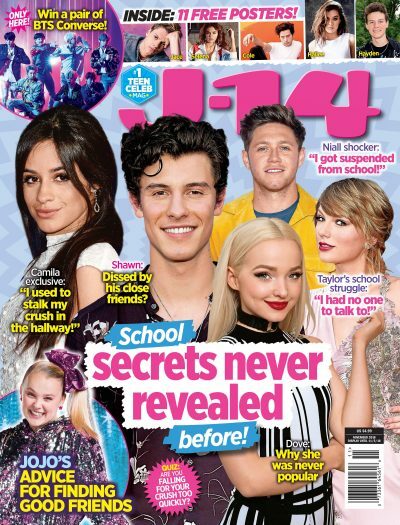 “JoJo Siwa: ‘It’s OK to stand up for yourself!’” originally appeared in the July 2017 issue of J-14. Watch your favorite Nickelodeon stars at The Thundermans 100-episode celebration below!